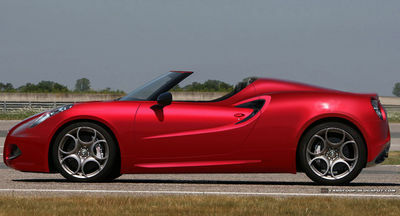 Anton Gjorsevs rendering of the convertible 4C. Alfa Romeo may just release a Spider version of the 4C, nothing is confirmed yet but there are indications from my sources that this is a real possibility. The 4C Coupe would be a very easy car to transform into a Spider, the chassis, being made of carbon fibre is immensely strong and I think that it would take very little strengthening to make it into a spider. 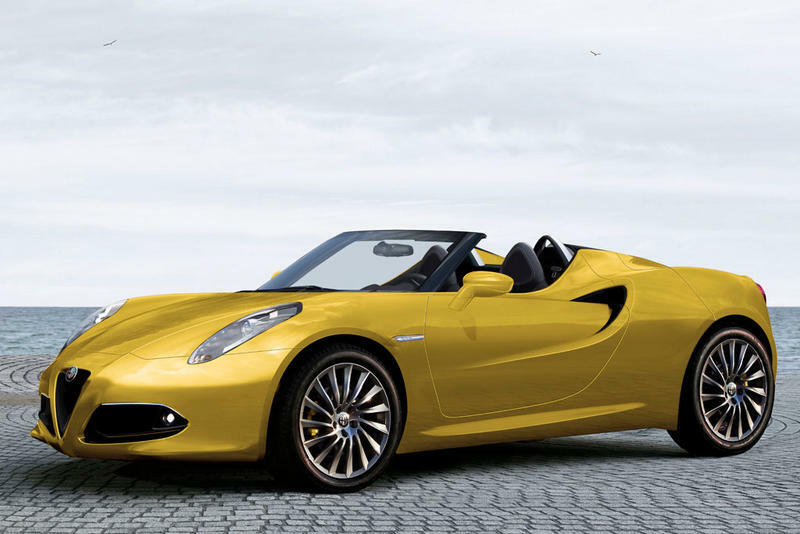 I suspect that a 4C Spider would be very similar in performance to its Coupe cousin, so top speed would be around 160 mph and the 0-60 time would be around 4.5 seconds. I suspect that production will depend on how sales of the Coupe go, if the Coupe continues to sell like hot cakes then Alfa Romeo will not be able to produce enough chassis's to meet demand. Chassis production is supposedly limited by the supplier to around 3500 units per annum. However Alfa may decide that as this is a "halo" model that it would be worth producing a Spider just to show that the can make an absolutely stunning spider that will be as good in its own way as any of the other top of the range convertibles that are produced by other manufacturers. This would mean that the Spider that is now under development with Mazda would have to be a clearly defined model in its own right. A 4C spider would in my opinion be an absolutely amazing car, to many top of the range sports convertibles are either too fast or don't accelerate fast enough, think about it much over 150 mph it is more that just uncomfortable it is positively dangerous with the roof off, the wind at that speed tears at your hair, anything loose in the car is turned into a missile that travels round the car in a vortex and constantly batters you, grit from the carpet gets sucked up and plastered in your eyes, very, very uncomfortable. Meanwhile when you are at the traffic light grand prix you dont want to be left behind by some barry boy in a Subaru Impreza, to me this sounds like the perfect convertible, go on Alfa make this for me please!